I finished this sweater about a month ago but I didn’t want to post it online until it was gifted. 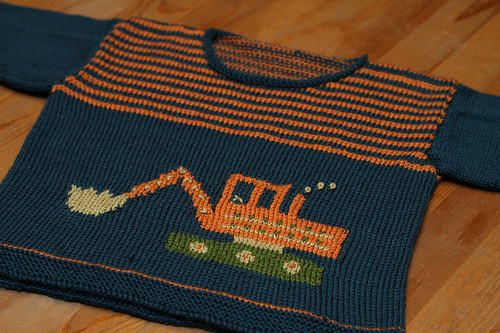 It turned out pretty great except there is one little twisted stitch right in the front, a couple rows below the digger’s tracks. Boo. I didn’t even see it until I was photographing it. I guess that at least means it’s not that noticeable. This was made for my 16 month old nephew, in a 2-year old’s size, but I think it will fit him now. I knitted this up in Mission Falls 136 Merino Superwash. I really love the texture of Mission Falls wool, and it has this fabulous stretchiness which I think will help the sweater fit longer. But there are some drawbacks. I had to rip back the front stripes at one point because of some missed stitches, and trying to pick up the row of stitches after they’d been ripped back was a total nightmare. The plies in the yarn were separating and I had to trade them back and forth on needles several times before I got them tidy enough to start knitting again. The pattern was from Handknits for Kids by Lucinda Guy, a book that’s full of lots of cute kids sweaters, hats, and small toys. But I discovered after finishing the first sleeve that I was running out of my main colour of yarn, even though I had bought the yardage noted in the pattern. I read on Ravelry that this seems to be a problem with the patterns in this book, so I recommend buying an extra ball of yarn for any of these patterns. The other FO I’m posting today was not a Christmas gift, but a request from a coworker of my Mom’s named Brenda, who really wanted a hat like the Foliage hat I made for my Mom about a year ago. 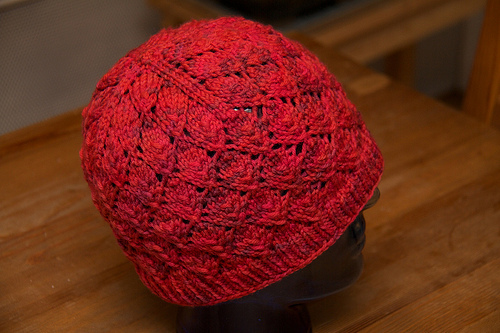 Here it is in Dream in Color’s Lipstick Lava (pattern from Knitty). I think it turned out quite well. In fact, so well I just might make another one with that same yarn, since I have half a ball left, and try adding some beads. I also finished the Hat fit for a Boyfriend on Christmas Eve, just for fun, but I have yet to grab a photo of that to post. I had to make that one extra big and extra deep for Chris’s giant head, and while it looks good I could certainly have added a few more rows before the decrease and it still wouldn’t have been too big. What lovely FO’s! I especially adore that digger!